Happy New Year from all of us at AIRKENYA Express. Whilst Airkenya will suspend the Coast routes of Lamu, Malindi and Diani wef 11th January 2019, Regional Air Tanzania takes delivery of the Dash 8 aircraft - a big boost to the airline. Regional Air Services a subsidiary of Airkenya Express, will offer a pressurised service with a greater capacity on the Serengeti - Zanzibar route. The Dash 8 simply puts the airline ahead of the pack. AIRKENYA Express meanwhile is gearing up for the Maasai Mara - Entebbe service wef 1st June 2019. The service routes via Kisumu, meaning you can enjoy your Kenya safari and cross over to Uganda and enjoy Gorrila trekking and the best of what Uganda has to offer on their tourist circuit. Airkenya's subsidiary in Uganda, AeroLink Uganda will take passengers into Bwindi, Kihihi, Semliki, Murchinson Falls are just some of the game parks you can connect to. AIRKENYA's Two Dash 7's continue on the safari circuit with a maximum capacity of 50 passengers per aircraft setting the airline in good stead for large groups, indeed the handling of incentive groups is Airkenya's forte. AIRKENYA continues to fly 3 times daily and 4 times daily between July - September into the Maasai Mara. Daily schedule flights are available to Amboseli, Nanyuki, Meru, Loisaba, Lewa Downs and Samburu. 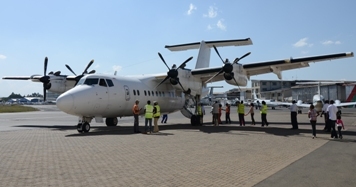 Additionally, the Kilimanjaro service from Wilson opens up the northern Tanzania circuit with connections on to Regional Air Services. As we enjoy the current high season we recognize that we would never have been where we are without your support. AIRKENYA was the pioneer airline to offer schedule flights into Ukunda and also the oldest operator into Lamu. The coast routes of Ukunda, Lamu and Malindi have seen tremendous growth in seat capacity over the last few years. With this in mind, and taking cognizance of the fact that the routes are well served, AIRKENYA wishes to notify you that effective 11th January 2019, it will be suspending the three coast routes of DIANI, LAMU and MALINDI. This gives the company the chance to serve you better regionally by redeploying capacity to where it's needed more. We are pleased to announce that our subsidiary Airline, Regional Air Services, Tanzania, will be boosted with a Dash 8 service from SERENGETI to ZANZIBAR, effective 1st December 2018. Effective 1st June 2019 and subject to regulatory approval, AIRKENYA will operate a MARA - ENTEBBE - MARA service via Kisumu to link with our Ugandian Subsidiary, AeroLink Uganda, for onward connection to Bwindi Impenetrable Forest, Queen Elizabeth National Park, Murchison Falls and Kidepo Valley National Park thus cementing a truly East Africa Safari circuit. Airkenya has had to suspend service into the Olare Orok Airstrip, Masai Mara with immediate effect due to the heavy rainfall that has been experienced over the past week. The airstrip has become slippery. Alternative, airstrips are the Mara North Airstrip and the Olkiombo Airstrip. Passengers are advised to advise the airline of their best alternative airstrips. Anna Nzomo who has been with AIRKENYA for over three decades has made the decision to retire. Anna, has been a household name at AIRKENYA, having served the airline in various capacities. Anna was holding the position of Commercial Director before her retirement but she was well known as the Operations Manager for many years before that. The Management and staff of AIRKENYA sincerely thank Anna for her unwavering dedication to AIRKENYA and the industry. Anna has taught many and will be missed at AIRKENYA, her knowledge of the local aviation industry and dedication to work has largely contributed to AIRKENYA'S success. Airkenya is delighted to welcome its second helicopter an AIRBUS AS 350 B3E to its fleet. 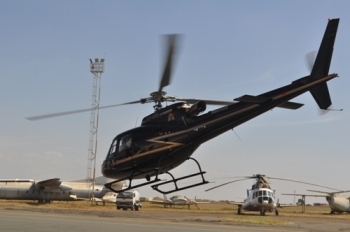 AIRKENYA Helicopters is making inroads into the growing scenic flights and safari experiences offered by the helicopters. From Mt Kenya scenic flights with breakfast or trout fishing, to flamingos sightings on Lake Magadi or further north at Lake Bogoria, the amazing Gura and Karuru waterfalls on the Aberdares Range or flying up to Lake Turkana will take your breath away.. The Helicopter offers wonderful up close and personal experiences, With excellant pilot/guides, you or your guests will be in for a real treat. The new Helicopter will fly with two doors open offering unbriddled viewing for guests or the discerning photographer. Save hours yourself or your guests hours and take Airkenya helicopters to JKIA with pick up/drop off to Westlands, Runda, Karen with VIP assist on offer you can save time and fly direct to/from JKIA. The Helicopter seats up to 5 pax with 15kg luggage per person in soft bags. Loisaba daily with minimum 2 pax wef 1st June 2017. As Loisaba gains in popularity, this vast wilderness will now be served daily with a minimum of 2 passengers. Guests looking to fly onwards to the Masai Mara from Loisaba will also be able to book this service. We would like to thank you for flying with us in 2016. We certainly hope we have the pleasure of flying you and your family in 2017 to Kenya's finest game parks and beaches. Airkenya Helicopters will get a boost with a second brand new AIRBUS Helicopter AS 350 B3 joining the fleet in early 2017. The greatest natural spectacle on earth is now showing in the world famous Masai Mara. Don't miss your seat with three daily flights into the Masai Mara, AIRKENYA'S early bird at 8.00am, the mid-morning at 10.30am and the 2.00pm departure from Wilson Airport into the Masai Mara. The wildebeest closely followed by Zebra are making their way for the lush green grass of the Masai Mara after the long rains. Crossing crocodile infested rivers, the river-crossings are a fantastic experience, watch quitely as the wildebeest get close to the river, beat a retreat until the leader jumps in and they all then follow swimming across, the crocodile quickly make for their long anticipated meal. The circle of life in full glory in the Masai Mara - don't miss the show this August. Airkenya will fly into the Loisaba airstrip with a minimum of 6 passengers wef 1st July 2016. You can book online or call Airkenya on Tel. 254 02 3916000 to book. Loisaba made famous for its star-beds, Ol Malu, Ekorian, Mutama, Sosian, Suyan and Sabuk Lodges are all accessible via the Loisaba airstrip. Airkenya now flies direct into the Olare Mara Airstrip, the airstrip serves the luxury and renowned Olare Mara Kempinski Camp, Mara Plains, Mahali Mzuri, Kicheche Bush Camp and Porini Lion Camps. Airkenya has made it easier to get from the beach into the world famous Masai Mara Game Reserve with its daily flight via Wilson. Depart Ukunda Airstrip at 11.00am arrive at Nairobi's Wilson Airport for lunch at Dormans courtesy Airkenya and at 2.00pm depart into the Masai Mara. 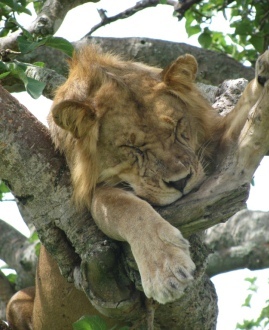 You will arrive in the Masai Mara in time to check into your camp/lodge before you get out for your first game drive. AIRKENYA is pleased to announce Flights to Migori and a NEW Masai Mara schedule starting 1st June 2015. Please see full details below. With effect from 1st June 2015, Airkenya shall offer a scheduled flight into Migori and ground transfers to Tarime, where sister airline Regional Air Services (RAS) will fly passengers onwards from Tarime to Seronera, Serengeti and the Selous. The new service is set to reduce the time taken to move between the Masai Mara into the Serengeti or vice versa. includes ground transfer Migori - Tarime and vice versa. AIRKENYA shall honour the 12.45pm departure where Passengers are already booked and ticketed. includes all of the mentioned destinations. Please note, arrival to drop/pick clients is determined by the aircraft routing. We request Airkenya Operations be contacted for more precise arrival/ departure times from Nanyuki, Samburu and Lewa Downs. NO CHANGE on the WILSON 09.15am departure to Samburu, Nanyuki, Lewa Downs and Meru. We wish to advise that AIRKENYA shall operate into the KALAMA Airstrip for all properties in the Samburu Area. Oryx and Buffalo Airstrips, will be served on charter basis only. Regret the service has been suspended with immediate effect. However, AIRKENYA shall operate the services where passengers are already booked. AIRKENYA/REGIONAL AIR appeals to Agents to ensure passengers connecting to KILIMANJARO/WILSON, MIGORI/TARIME have already obtained their TANZANIAN/KENYAN Visa's. Considerable delays are caused when passengers have to attain VISA's and impacts the on-time departures of onward services. Passengers must ensure they have all documentation inclusive of Yellow Fever cards. The new Timetable/Flight Schedule will be circulated to all Agents shortly. We sincerely thank you for your continued support and wish you good sales in the region. 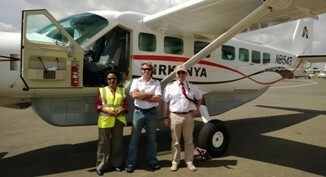 Airkenya has reinforced the flight against poachers with a donation of twelve Drums of Avgas fuel to the Tsavo Trust. 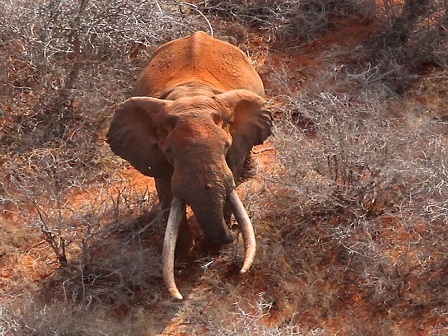 The Trust provides aerial patrol over Tsavo Conservation Area with a specific focus on monitoring the large Tuskers. The twelve drums were delivered to the Tsavo Trust Airfield near Mtito Andei in October 2014. This means the aerial surveillance can be increased by a further 7 hours per month or 84 hours per year. Richard Moller, Chief Conservation Officer at Tsavo Trust has thanked Airkenya, adding "...we have already used some of the fuel and have picked up important observations from the air such as freshly used poachers camp... KWS immediately deployed a ground team as a result of this find". Airkenya is committed to doing what it can to save Wildlife in the wild. Airkenya has done it again!!! 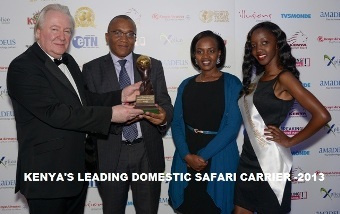 For the second year running Airkenya has been voted Kenya's Leading Domestic Safari Carrier. The Award is a fantastic achievement as it is left to the Nominations and voting process of the Agents the world over to cast their vote. Airkenya, General Manager, Capt Dino Bisleti has said how "delighted he was to hear the news and indeed strengthen the airlines resolve to continue to offer a second to none customer experience, from booking your flight to arriving at your destination". 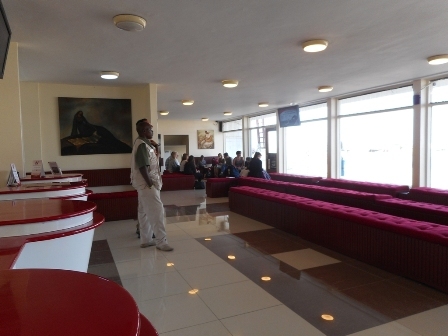 Airkenya reopened its Passenger Terminal, after a recent refurbishment. The new Terminal has an enhanced Security procedure which also improves passengers Check-in flows. The Lounge upgrade includes the Dormans Coffee Shop which now takes up both the Upper and Lower lounges with more seating capacity and a delightful new menu. Passengers can enjoy anything from a quick coffee and to a bistro style hot meal The Simply Classics Gift Shop offers lots of enviable items. Passengers will also enjoy FREE Wi Fi in the Lounge. Its been a double celebration for Airkenya at the start of the New Year, 2 days after the brand new Cessna Caravan arrived from the USA, its second Dash 7 arrived. There was champagne popping as the Crew alighted from the aircraft after a 5 days ferry flight. The Dash 7 STOL aircraft is the most robust aircraft with a seating capacity of 50pax. Airkenya is the leading domestic airline serving the tourist circuit and with the biggest capacity aircraft maintains its lead in the East African region. Airkenya starts off the New Year with the arrival of its seventh brand new Cessna Grand Caravan, the EX Series however, is the second of its Type with the airline. The brand new Caravan arrived this morning 2nd January 2014 from Wichita, Kansas, USA. Airkenya General Manager, Capt Dino Bisleti, together with Operations Manager, Anna Nzomo and Engineering Manager Alan Oliveria received the Aircraft. Airkenya is the proud winner of Kenya's Leading Domestic Carrier at the just concluded World Travel Awards on 16th October 2013. 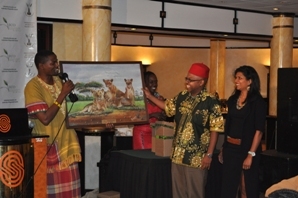 Airkenya received the award at a dazzling ceremony at Safari Park Hotel and Casino. World Travel Awards supports, promotes and develops the global travel and tourism industry by identifying and rewarding excellence and inspiring, practioners to continually raise the standards of key products and service offering. Eco Tourism is about respect for the environment and a major component is capacity building for community development. 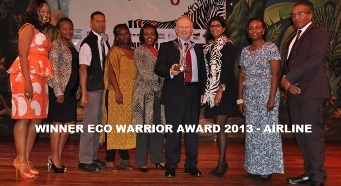 Airkenya was awarded the coverted Eco Warrior Award 2013 - airline category on 24th of September at Safaripark Hotel. Indeed, one of Airkenya major contributions is the building of a world class primary education institution using the most eco friendly materials and innovations. The schools classrooms and staff houses are lit by solar power and the septic tank biodegrades all the waste 100%. Airkenya’s sixth brand new Grand Caravan arrived on the 25th of July 2013 from the Cessna Factory in Wichita, Kansas, USA. 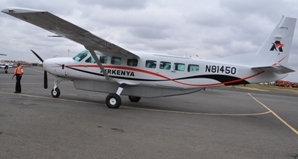 Airkenya has acquired the latest 208B Cessna Grand caravan EX that was certified this year January 2013.The new model is Cessna grand caravan Ex that is powered by 867 Shaft horse power , P &W engine PT6A-140 that adds a great deal of power thus improving climb by 38%. The 11 seater Caravan is also equipped with the latest integrated flight instrument system, all glass suite cockpit, latest avionics package which includes traffic avoidance collision system, (TACS), enhanced ground proximity warning (EGPWS) and an efficient auto pilot system amongst many other features. 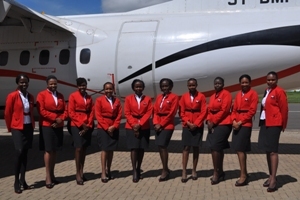 Airkenya’s General Manager, Capt Dino Bisleti has indicated “the Caravan will be operated with two pilots as per the airline crewing policy and it will complement Airkenya’s fleet to better serve the airline’s many scheduled destinations, the Caravan is a robust aircraft and is suited for bush flying”. The Caravan’s arrival comes in the wake of a flourishing peak season. Airkenya has made the decision to fly into Oryx Airstrip located within the Samburu Game Reserve effective 1st June 2013. The Oryx Airstrip will conveniently serve all properties located within the Samburu Game Reserve and those just outside. 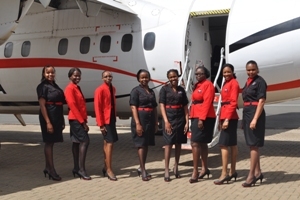 Airkenya has adopted new uniform blending safari wear with Airkenya colours -red and black. Local designers were briefed on the look before the final decision was made. As the premier domestic safari airline in Kenya, we want our passengers to feel a sense of safari, while maintaining the professionalism and friendliness of Airkenya. The new look is a refreshing move away from traditional suits. 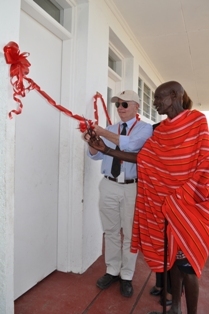 Airkenya proudly handed over two new classrooms and a two bedroom Staff House to the Emarti Primary School in the Masai Mara on 25th February 2013 having made good its promise for the first phase of the building of Emarti Primary School, at a cost of Kenya Shillings 10million. Airkenya General Manager, Capt Dino Bisleti in his speech during the handing over ceremony said he "was proud to have completed the first phase of the school”, whilst pledging future support he said he also "hoped to see children out of Emarti School come for employment with Airkenya and to fly our aircraft”. The Mara District Education officers thanked Airkenya "for the quality of the classrooms built and indicated this should encourage performance and enrollment in the school”. 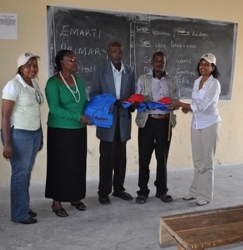 Airkenya made the decision that the most beneficial corporate socially responsible project would be education. Indeed, to uplift the livelihood of people and to safeguard the environment, education was the single most important facet. 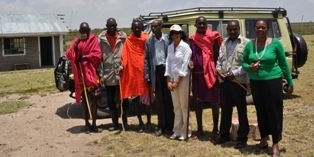 The Masai Mara is Airkenya's flagship destination with three flights daily it was an obvious choice for the school. The school which will eventually have boarding facilities, dining/school hall plus new classrooms for standards 1 – 8 and a Nursery School is a long term project for Airkenya with a total cost of not less than US$1.5million. 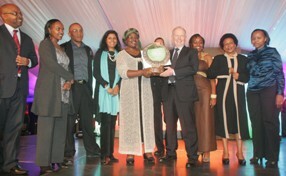 Airkenya received "Judges Commendation Award" during the Eco Warrior Awards held at The Nairobi Serena Hotel in November. Presenting the Award to Airkenya's Corporate Quality Manager Abu Bakari and Marketing Manager Cheryl deSouza is Eco Tourism Chief Executive Kahindi Lekalhaile. Manager, Maryanne Nganga received the Award. 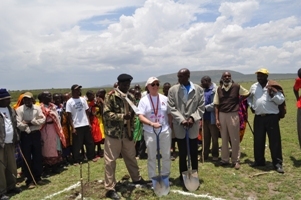 Airkenya has made good its promise to the Emarti School in the Masai Mara with a ground breaking ceremony for the first two classrooms and staff house. The ground breaking ceremony took place on Monday 24th September 2012. The new buildings will be ready come the new year. A detailed Masterplan was commissioned by Airkenya whereby the school which will eventually have boarding facilities, dining/school hall plus new classrooms for standard 1 – 8 and a Nursery School. The project will cost Airkenya $1.5million this is a long term project. Airkenya has flown into the Mara for many years and indeed the Masai Mara being the flag ship destination it became only natural that the Masai Mara was the area that Airkenya wished to see school project come into fruition and indeed give back to the community. 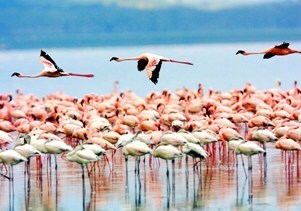 Airkenya will effective 21st December 2012, commence scheduled flights into Lake Nakuru National Park. Airkenya will land at the Naishi Airstrip, clients can look forward to a 35minutes flight into this spectacular National Park renowned for its prolific bird life and animal sanctuary. AEROLINK all set to fly! AeroLink Uganda Limited a subsidiary of Airkenya Express Limited is proud to announce the commencement of its domestic schedule and charter services following the successful issuance of its Air Service License (ASL). AeroLink is based and will operate out of Entebbe International Airport and will offer daily flights into Bwindi Impenetrable Forest (Kihihi Airstrip), Queen Elizabeth National Park (Kasese Airstrip) and Murchison Falls (Pakuba and Bugungu Airstrips). AeroLink will provide a convenient and affordable link to the Ugandan national parks. 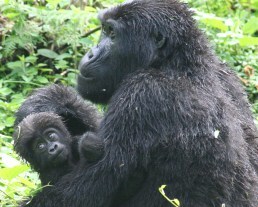 Visitors to the national parks will now have an opportunity to experience the exploding waters of the River Nile and its cocktail of activities one day and look into the expressive brown eyes of the mountain gorillas the next day leaving ample time to savor the beauty of Queen Elizabeth National Park often referred to as 'The Pearl of Africa'. Kasese, also a business destination and will serve the needs of business passengers visiting that area. AeroLink will commence its operations with Cessna Grand Caravans which come equipped with the very latest technology in flight instruments exhibited in a full glass cockpit. It has excellent hazard avoidance abilities to help the crew see and avoid dangerous weather terrain and other aircraft . As per Airkenya's crewing policy, the flights will be operated by two pilots and will carry 11 passengers only. AeroLink together with its sister companies Airkenya Express in Kenya and Regional Air Services in Tanzania will be in a position to offer its dynamic client base a truly East African experience.Log on to www.aerolinkuganda.com for the schedule and rates. 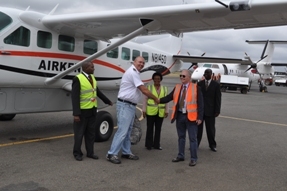 Airkenya's third brand new Grand Caravan arrived on Saturday 14th July from the Cessna Factory in Wichita, Kansas, USA. 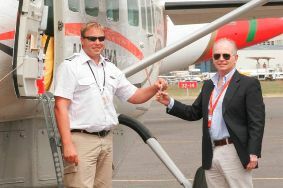 Pictured is Capt David Dobble who flew the aircraft handing over the keys to Airkenya, General Manager Capt Dino Bisleti. The 11 seater Caravan is equipped with the latest integrated flight instrument system, all glass suite cockpit, latest avionics package which includes traffic avoidance collision system, (TACS), enhanced ground proximity warning (EGPWS)and a efficient auto pilot system amongst many other features. This is Airkenya's third new Caravan in 18 months. Airkenya's General Manager, Capt Dino Bisleti has indicated "the Caravan will be operated with two pilots as per the airline crewing policy and it will complement Airkenya's fleet to better serve the airline's many scheduled destinations". The Caravan's arrival coincides with the July, August peak season. AIRKENYA wins “AIR OPERATOR of the Year” again! 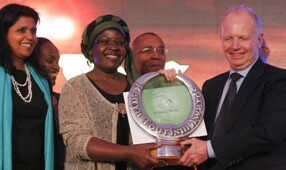 Airkenya scooped the Air Operator of the Year Award for the second year at the Kenya Tourism Awards 2012. The gala brings together the tourism industry to celebrate the gains the sector has made in sustainable tourism, and to recognize individual excellence in the sector with an aim of setting industry standards high. The theme of this years’ awards was 'Celebrate, Sustain and Diversify Tourism'. The glamorous Awards evening which is in its second year had in attendance Asst Minister of Tourism Cecily Mbarire together with Moroccan Tourist Federation President Ali Ghannam. Airkenya has traditionally been well regarded for its high safety standards and training of Crew forms an integral part of this. The Judges of the Awards look for the company who exhibits creative marketing, has a training schedule for staff and contributes towards social responsibility amongst other attributes. 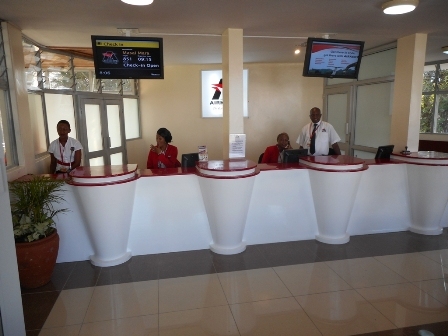 Airkenya operates out of Wilson Airport and offer passengers an exclusive check in at its Passenger Terminal. Airkenya flies scheduled flights into the Masai Mara, Samburu, Amboseli, Nanyuki, Lewa Downs, Meru, Diani, Lamu and Malindi in Kenya. Airkenya also flies into Kilimanjaro. In 2012, Airkenya launched AeroLink its subsidiary airline in Uganda, which will operate schedule and charter flights into Uganda’s major game parks. Airkenya Management and Senior Managers attended the Gala Awards evening and General Manager, Capt Dino Bisleti said in his acceptance speech “its tough to stay on top but we have done it for the second year and I want to thank the Airkenya team who work so hard to keep us on top”! Airkenya Express is spreading its wings to Uganda with the start of a new airline AeroLink Uganda. The new airline will offer scheduled and charter flights into Uganda’s major game parks. The start date for scheduled flights will be 15th June 2012. Aerolink will be based and operate out of Entebbe International Airport with flights into Bwindi Impenetrable Forest (Kihihi airstrip), Queen Elizabeth National Park (Kasese airstrip) and Murchison Falls (Pakuba and Bugungu airstrips). This will enable easy connections into Uganda’s national parks. Visit www.aerolinkuganda.com for further flight and fares. For further information contact anne.barare@aerolinkuganda.com. 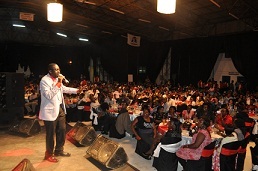 Airkenya once again treated agents and tour operators to a sensational evening of Comedy at the end of March this year. The Airkenya hangar was transformed into starry night with a stage for the main performance. 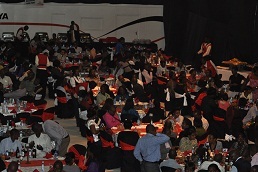 The hangar was filled to capacity by the time dinner was served and the entertainment begun. Kenya’s best entertainers and comedians - including Churchill, DJ Jesse, Mdomo Buggy, Eric Omondi and Jalango - had guests in stitches. Airkenya’s General Manager, Capt Dino Bisleti thanked guests for their support to Airkenya and at the same time announced the start of Airkenya’s subsidiary airline in Uganda AeroLink. AeroLink will begin schedule and charter flights within Uganda effective 15th June 2012 out of Entebbe. He also introduced AeroLink Country Manager, Anthony Karanja and Anne Barare as Sales Manager. Also present were Airkenya’s Tanzanian subsidiary Regional Air Services, ably represented by General Manager Hamza Mwapacha and Operations Manager Pamela Stevens. Airkenya Operations Director, Anna Nzomo thanked guests for turning out and for their support over the last year. There was plently of food, drink and laughter during the evening and the party could have gone on all night had it not been for that fact the next day was a working day! 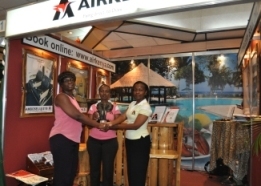 Airkenya won the Best Stand Award in the Service Sector at this years’ Magical Kenya Holidays Tourism Fair at the Sarit Centre held in March. Airkenya has participated in the show since its inception. This is the “biggest local event that we participate in and we are thrilled to win the overall best stand in the service sector” said Airkenya’s Marketing Manager Cheryl deSouza, she went on “we sell some seriously discounted fares to encourage local tourism”. Airkenya’s Sales Manager, Carole Ndegwa together with Airkenya Reservations Manager Catherine Kimwele and Digital Executive Rahab Ngugi manned the stand for the 5 days of the show and have indicated this was amongst the best shows to date with many clients making bookings for the upcoming Easter and school holidays. Carole Ndegwa also indicated “there were many enquires too and if these materialize the second quarter will look pretty good”. The future is looking bright for Emarti Primary School in the Masai Mara as Airkenya Express will support the school in a number of ways going into the future. 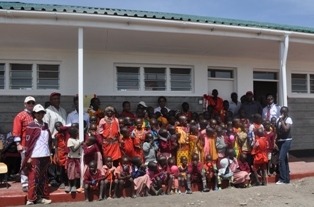 Currently, the school has only two stone classrooms for standards one and two and a small mabati room for the pre-school unit which takes children from 3 years old. The school has a total of 61 students. Emarti school was the brainchild of Chairman Ole Kasoe, who together with the Kasoe Community purchased ten acres to start a school. Currently, unfenced, the school wishes to grow to a fully fledged primary school. Some of the needs include; furniture, water, kitchen, staff housing perhaps even a feeding program which will nourish the school children for better learning. Emarti is now a registered Government school with Headmistress posted to the School by the Teachers Service Commission. Esther Silantoi dreams of seeing more children in the community “come to school and get an education rather than marry off early and start having children..”. Being unfenced, the school is exposed to the dangers of wild animals coming close to the school and even elephant are not uncommon. Airkenya made a fact finding trip this past month and donated reading material for the children. The children were all smiles when the Senior Warden, Narok County Council Airkenya Marketing Manager, Cheryl deSouza and Digital Marketing Executive Rahab Ngugi visited the school recently. Airkenya Express has taken delivery of a Helicopter! The five-seater Helicopter will be available for private charters. This high performance AS 350 B3 Helicopter arrived late 2011. The Helicopter is powered by an Arriel 2B engine and has an advance avionics package that permits the pilot to closely monitor engine performance and accurately navigate to destination. This Helicopter was the first of its kind to land on Mount Everest, the highest peak in the world, a performance achievement that few Helicopters in this category can match. The AS350 B3's speed and range combined with a roomy, quiet cabin make it suitable for a variety of missions from emergency evacuations to executive transport. It is an ideal Helicopter for a hot and high operation. It is a safe option for “bush flying” and difficult terrain. It can accommodate a maximum of 5 passengers and cruise at a speed of 150 miles/hr. Airkenya's Second brand new Grand Caravan arrived on Saturday 26th November from the Cessna Factory in Wichita Kansas USA. The 12 seater Caravan is equipped with the latest integrated flight instrument system all glass suite cockpit latest avionics package which includes traffic avoidance collision system TACS enhanced ground proximity warning EGPWSand a efficient auto pilot system amongst many other features. Airkenyas General Manager Capt Dino Bisleti has indicated the Caravan will be operated with two pilots as per the airline crewing policy and it will complement Airkenyas fleet to better serve the airlines many scheduled destinations. The Caravans arrival coincides with the mid Dec start of the high season. Airkenya presented prizes to the winners at Airkenya Face Book contest held over two months of August and September. Participants were asked to submit an essay of any holiday/travel experience within Kenya. The three winners whose stories were most interesting and attracted the highest votes won the Grand prize of two nights for two at the Swahilina dhow in Lamu Second prize was two nights for two at Kichwa Tembo in Maasai Mara and Third prize was two nights for two at the Lantana Galu Beach. There were over 120 entries with over 50 submissions going to the final level. with full board accommodation. Including sailing snorkelling Lamu Island tours and fishing and return Lamu flights on Airkenya. Second most voted story won a prize of 2 nights for two at Kichwa Tembo in the Masai Mara with full board accommodation. Game drives and return Masai Mara flights on Airkenya. Third most voted story won two nights for two at Lantana Galu Beach with accommodation on bed only Self catering and return Diani flights on Airkenya. To read more on their stories go to link: http://www.facebook.com/Airkenya. The prizes were presented on the 2nd of November at Airkenya Offices to the winners. 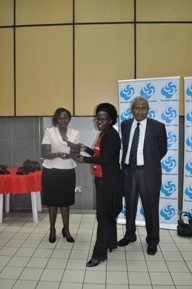 Present were Airkenya Operations Manager Anna Nzomo who gave out the prizes. Others were Base Camp General Manager Annette Bulman who gave out the Grand prize to Lilian Kwamboka. And Beyond General Manager Theresa Pereira who presented the second prize to Khatija Aziz . Lantana Galu Beach Director Sophie Govani who presented the third prize to Grace Wangui. Airkenya emerged the Air Operator of the Year at the inaugural Kenya Tourism Awards on 23rd June 2011 at a dazzling ceremony at the Carnivore grounds. The event organized by the Kenya Tourist Federation had seventeen categories for nominations of awards in the Tourism sector. Airkenya trumped as the most reliable safe airline and achieved a score 77 in this category. The Air Operator of the Year Award was looking for the airline that best achieved: on time departures and arrivals undertake continuous staff training and development resource saving initiatives waste reduction and management health and safety policy and procedures amongst others. The evening was attended by the Kenyan tourism fraternity and was further graced by the presence of UNWTO Secretary General Dr. Taleb Rifai and his wife together with our Minister of Tourism Hon Najib Balala and his wife amongst others. 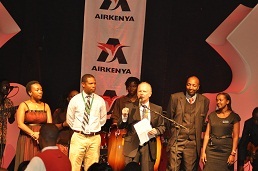 Airkenyas GM Dino Bisleti together with Airkenya staff received the award during the ceremony.